Guess what, Palak Paneer Recipe is Luna’s today spotlight – whom I truly believe will cater all the tricky requirements of every by-stop eater of yours. With spinach being one of the two major ingredients, this Palak Paneer recipe is designed to cater even the pickiest vegetarians. Bearing such fancy look, it’s racy and peppery in taste – deliciously healthy. Now, without further ado, here’s how the dish could do to your health. Palak Paneer has been proven by the locals to assist digestion, thanks to the large content of calcium and protein. Most specifically, a gummy substance from spinach known as mucus also helps prevent acid reflux. Additionally, other nutrients such as magnesium, folate, potassium and a range or vitamins also play vital roles in assisting heart health and muscle function improvements. 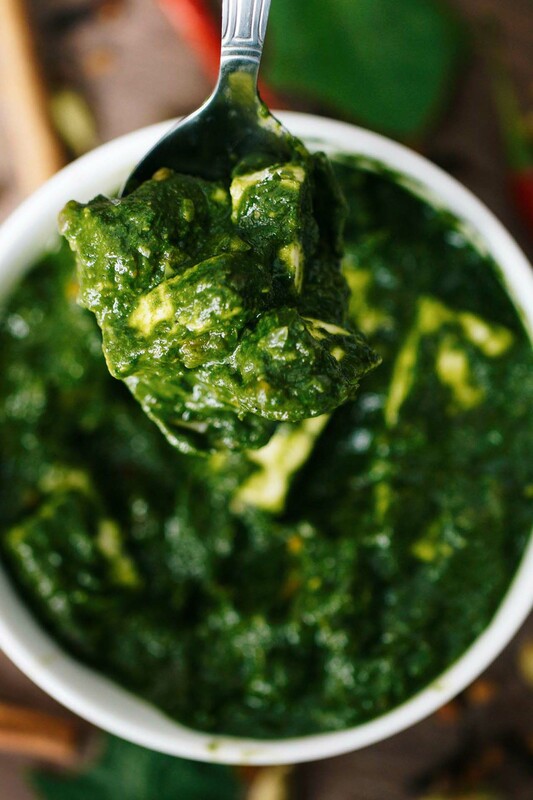 It is no surprise that Palak Paneer has been a go-to choice of Indian households for so long. As the dish became more and more popular, it started earning more and more credits from the vegetarians worldwide. Vegetarians aside, women in pregnancy also found numerous benefits of this earthy-tasting dish. Thanks to the enriched source of vitamin A and a substance called folate in spinach, the dish is believed to help improve immune system efficiency for both mother and baby. In the meantime, the baby’s brain function development and nervous system enhancement are also taken into account. Palak Paneer recipe is extremely easy to prepare for daily meals. Moreover, it provides full of goody, delicious taste as well as numerous nutrients. The dish is perfect when served with naan, chapati, or roti. 2/3 heaped cup paneer cubes or cottage cheese. ¾ cup onions fine chopped or ½ cup paste. ½ cup tomatoes (deseeded) or puree. ¼ tsp kasuri methi or dried fenugreek leaves. ½ tsp coriander powder (optional). ¼ tsp cumin powder or jeera powder. ¼ to ½ tsp garam masala. 1 tsp garlic paste or ginger garlic paste. 1 inch cinnamon stick or dalchini. ⅛ tsp cumin or jeera. 2 tsp oil or butter as needed. 2 – 4 tbsp fresh cream or 10 cashews (optional). Preheat your pan in medium level. Add green chillies and spinach to fry with oil. It should take about 2-3 minutes for the spinach to wilt off thoroughly, so be careful not to overcook. Set aside the spinach to chill to the room temperature, then feed it through the blender with green chilies. Grind the mixture to smooth puree. Pour cinnamon, cloves, and cumin onto a heated pan. Adding onions in and stir them all together properly until the onions turn transparent. Add garlic paste and keep frying till the whole medley turns golden brown. Add tomatoes and maybe some pinches of salt; then kasuri methi, garam masala and cumin powder (or coriander powder if desired). Continue to saute until the texture is just mushy and soft, to the point that they’re no longer too sticky to the pan’s surface. Pour 1/2 cup water and keep stirring until the mixture is thickened and smooth. After reaching the desired consistency, add the pureed spinach and fried paneer. Cook until simmers. You can give an additional 2 tsp of cream to the whole mixture for its gravy to be more creamy and tasty. Serve: I’ve been passing by recipes where people serve Palak Paneer with roti or naan. I myself had it with both white rice and brown rice, and it just came out exceptionally good! So I may take a sheer guesswork that other kinds of cooked grains and seeds will do well too. You can also try cooked quinoa to call it an attempt. Do not over blanch palak as nutrients will be lost. Soak the paneer for 30 mins in warm water pre-cook to tenderize it. Opting for low-fat version of cottage cheese is even a better choice.